This actually made my eye twitch and I deal with stupid people doing stupid things all day. This is a level of disrespect that Colin Kaepernick would be proud of, but the rest of us that actually love our country find this behavior abhorrent. 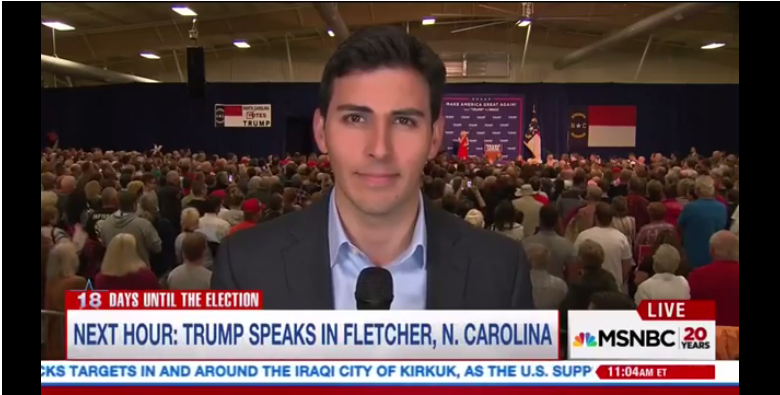 MSNBC anchor Tamron Hall had to actually apologize for one of her reporters after he talked through the ENTIRE National Anthem at a Donald Trump rally in North Carolina. He actually had the gall to say that it was “a little difficult to hear” the anchor after a woman started singing the Star Spangled Banner behind him. Apparently his breeding as an American didn’t prevent him from stopping the segment for the less than one minute it takes to listen to the song and he disrespectfully yammered on about Trump’s poll numbers the entire time. This whole video makes me deeply uncomfortable. To her credit, Hall did apologize for his despicable behavior, before letting him go, but I don’t know why on Earth she said that he must not have realized that the Anthem was being preformed behind him because unless he’s deaf (he’s not) that is the one song that everyone in America can recognize. There is absolutely no excuse for what he did and as an American it’s deeply disappointing to see someone disrespect our country that way.